Named after a mythological Inuit sea woman, the planet Sedna was first discovered in 2003. Its return to our solar system after 11,000 years of orbit has been tied to the huge tsunami that struck Indonesia, Thailand, and India in 2004 as well as to the increased occurrence of other marine and weather events over the last decade. And just as it is affecting the waters of our planet, Sedna’s energies are also affecting each of us as individuals. Exploring the impact that planetary bodies have on Earth and on humans, Jennifer Gehl reveals how Sedna’s energies can be worked with for healing ourselves, others, and the planet. She explains how the naming of this planet after the archetypal figure of Sedna--and her myths--provides major clues to the message that Sedna’s return is sending: a clear warning about the sustainability of the planet and the oceans, the source of all life, and an invitation to awaken to the parts of ourselves that have been ignored, abandoned, and cast out into the cold, just as Sedna was when she was drown in the Arctic Ocean. The author examines the astrological chart for Sedna’s discovery, providing an in-depth look at how certain aspects, particularly the quincunx, support the legend of Sedna and its impact on human health. 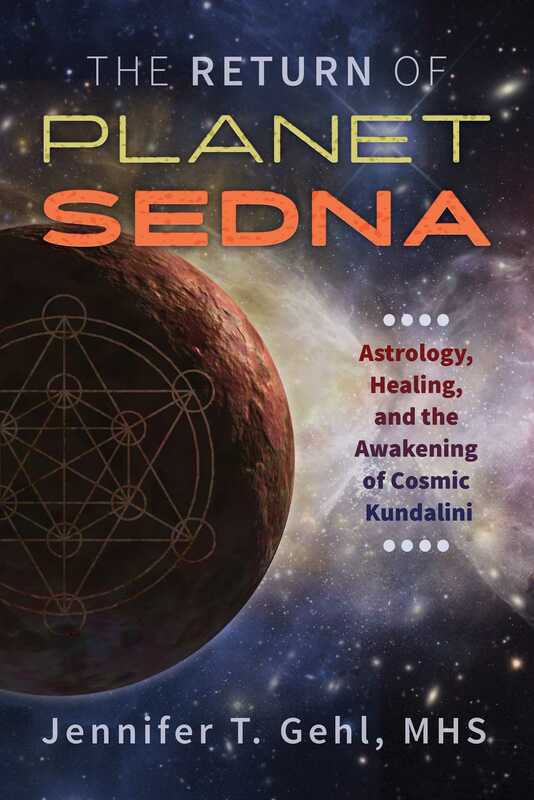 She looks at how Kundalini energy courses through planets and people alike and how planetary transits activate a form of cosmic Kundalini energy, with Sedna’s return marking a major stage in this awakening process. She reveals how Earth’s ley lines are mirrored within the body’s meridians and offer a way to tune ourselves to the cosmic frequencies that Sedna brings. Examining the story of Sedna mythologically and astrologically, Gehl explains how Sedna’s last appearance 11,000 years ago occurred at the end of the Ice Age when waters disrupted and divided our world. Her return, rather than being a harbinger of disaster, is one of the way-shower and shaman. Symbolically, she lights the path for us to ignite our own immortality by surrendering to the inner path, revealing patterns and pathways for infinite healing potential, a new model of sustainability for the health of our planet, and a way to actively participate in our soul’s evolution. While it will likely take many years for the astrological community to agree on Sedna’s role in the individual horoscope chart, Sedna’s energy feels very much like “Triple Water,” a symbiosis of all three Water planets (the Moon, Pluto, and Neptune). In the Inuit Sedna myth we find “Moon themes” of exaggerated attachment to home and father that causes Sedna’s habitual refusal to marry and establish her own home as well as ancestral roots and family tradition that runs deep. We find “Plutonian themes” of betrayal, manipulation, power struggles, violence, and suffering that lead to the death/rebirth process, all stemming from close relationships (both marital and parental). We see Sedna’s struggle to express her authenticity, and the clash between her desire and the values of her Inuit culture. We also find “Neptunian themes” of non-ordinary reality. In the myth and astrology of Sedna there is a distinct shamanic energy: that of surrendering to the process of death and transformation, divining truth from “non-ordinary” states of being represented by the deep and mysterious ocean, and calling upon animal spirit guides to communicate with the Inuit people. Author and psychoanalyst Daniel Merkur, Ph.D., explains the word “shaman” to mean “he who is half hidden,” and the word “inue” to refer to “indwellers in nature” for which Inuit is plural. It would seem then, that Sedna’s return to our solar system facilitates this type of shamanic healing for the planet. By revealing those areas in need of transformation and rebirth, such as our relationship with water, primordial consciousness, and our history and ancestral roots, we can contribute to collective healing by doing our own “inner” work. To build upon Sedna’s shamanic message, now more than ever it’s important to understand the law of relationships at work from the most microscopic to the vast reaches of our cosmos. Relationships are alchemical in nature, producing anything from the lowest, most resistant vibration (lead), to the highest most superconductive vibration (gold). Therefore, it’s important to understand what happens to these relationships as planets change position so that we may derive the highest benefit from this alchemy. The term aspect describes the specific harmonic relationships that occur among planets as they move through the solar system. The impacts of planetary cycles on culture as the cycles of two or more planets come into aspect can be studied. For example, when Pluto (death/rebirth/power) and Uranus (unexpected change, awakening, liberation, rebellion) come into aspect, we have historically experienced radical change. The aspects behave in such a way that “alchemizes” the planets into a new form of expression, and those aspects with the greatest impact are the conjunction (0-10°), square (90°), and opposition (180°). Uranus transits a sign for approximately 7 years, while Pluto takes anywhere from 12-35 years. Uranus is more consistent because its orbit is not as elliptical as Pluto’s. When planets are closer to the Sun, the gravitational pull moves them faster. A planet’s effects on other planets may be noticed before it is even discovered by astronomers. In the same way, transit effects are often felt before an “exact” aspect with another planet. An example of the impacts of planetary interaction is mentioned in Richard Tarnas’s Cosmos and Psyche. The French Revolution, which occurred between 1789-1791, coincided with an opposition (180°) between Uranus and Pluto. William Herschel (1738-1822) had just discovered Uranus in 1781; Pluto had not yet been discovered. Once discovered, astrologers and astronomers determined where the planet was located at points in history. In this case Pluto’s location had been in opposition to Uranus at that time. While the exact aspect did not occur until 1791-1792, the opposition is similar to a Full Moon, building tension during the waxing phase and culminating at the completion of the 180° aspect. Powerful change occurs when it is just two planets such as these in a conjunction, opposition, or square. Imagine then, how transformative and far-reaching the effects of a triple conjunction would be. The only time in recorded history when Uranus, Neptune, and Pluto formed a conjunction occurred during the last half of the first century BCE, approximately (590-510 BCE), ushering in “the great awakening of the Axial Age.” Earth was transitioning from the Age of Aries to the Age of Pisces, and this new era evoked unprecedented change. Many of the world’s greats inphilosophy and religion incarnated at this time. In India, the birth of Buddhism and Jainism; in China, the birth of Lao Tzu and Confucius; in Israel, the prophets Jeremiah and Ezekiel; in Persia, Zoroaster and Zoroastrianism; and in Greece, the philosophers Thales, Anaximander, and Pythagoras. These examples represent a mere shadow of the many and varied influences planetary alchemy has had on Earth’s history. Yet it’s an important perspective and context to bear in mind as we examine Sedna’s potential impact. To get a handle on the shamanic energy of Sedna, particularly the bendable nature of space and time, it’s helpful to look at how one Sedna year compares to that of Earth’s. Earth’s year takes 365 days and moves through the four seasons during this time. Due to Sedna’s long, elliptical orbit, it takes approximately 11,500 Earth years for Sedna to orbit the Sun. Its location in space is so distant that we are forced to consider worlds far beyond that of Earth’s solar system. Sedna’s relationship with Earth stretches its perspective by multiple millennia, simultaneously reinstating the memory from our ancient past while beckoning us into the future. There is a multidimensional component to Sedna within the time-space continuum that synthesizes all that has been (past) with all that is (present), and confronts us squarely with new horizons (future). The fact that Sedna is so far away from us does not make it inconsequential. On the contrary, its impact is monumental, and will be alchemized (altered) as it combines with other planets to create a new phenomenon. Jennifer T. Gehl, MHS, instructs astro-harmonic medicine continuing education to licensed professionals. She is a certified Acutonics practitioner, astrology sound healer, and mentor with a master’s degree in health sciences from St. Francis University. She lives in Hollidaysburg, Pennsylvania.